So, you’re a fan of the 308. It’s a good caliber for all of your hunting and sporting activities. But a round like that demands a great scope for the best distance, impact, and accuracy. If a great scope is needed, what is the best scope for 308 bolt action rifle? Here is an outline of our top five picks, so you can get the best performance out of your 308 bolt action. For those who don’t yet know the advantages a scope has over open sights, there are many. Open sights or iron sight are fun, accurate, and arguably more durable and much cheaper than a good compact scope. However, open sights’ general advantage comes from shooting close range targets, and in better-lighted conditions. Another advantage is that it is more natural to align your eye automatically through the peephole onto a target. Sometimes with a scope, there is an eye-adjustment factor that takes some getting used to. Hands down, if you are going to be shooting long distance and/or in failing light conditions, as most hunters will, then you need the precision and magnification of a compact scope. Most scopes let more light into the view, making for better spotting and identification during a “prime time” hunt, where light conditions are not ideal. The options and features to consider when picking out the best scopes for you are vast. The first thing I consider when shopping for a new quality scope is my price range. The price of a quality scope will vary, depending again on features and caliber. They can range from the $50 area all the way up to several thousand. For a 308, most decent scopes will fall into the $150-$500 range. Once you determine what you are and are not willing to spend, you can start to decipher the features you need. Obviously, the more options and better quality is going to reflect in the price. Do you need a rugged, tough scope that will stand up to changing weather conditions? Do you need one with a lighted reticle or simple mildot? How about hand adjusted turrets or tool adjusted? And, what are your magnification needs? Some scopes have a rangefinder. All of these will impact and break down which scope is right for you. Weight and size can be a determining factor in your search for the perfect scope. The actual size of the scope can affect the weight and maneuverability of your overall rifle, making it more cumbersome to hall through the woods or stay on target. This coupled with recoil can have a huge impact on your shot. Other things to consider with the weight would be size and thickness of the optic lens, and whether or not the scope needs batteries for some of its features. A bulkier scope may be knocked off zero easier than a streamline scope. The ability to maintain your zero is definitely a desirable trait in the scope of your dreams, and the lower you can mount that sucker, the more accurate and stable your scope will be. The first thing you will want to decide on is the size of your lens and the clarity. Clarity is imperative for decisive shooting. You want to make sure the optic you choose is not only clear but also multi-coated to let in light and cut back on glare. Ideally, you want to choose a lens that is impervious to fog, waterproof and shockproof. Most fog proof lenses will actually be internally filled with a gas to minimize buildup of fog from the inside of the scope, like a double pane glass window. Secondly, you might consider your reticle and desired focal planes. The first focal plane will be more accurate a shot, with the reticle pattern actually increasing or decreasing in size with the magnification. The second focal plane will always leave you with the same size reticle regardless of magnification. Many people prefer the first focal plane. One of the best options for your reticle is probably either mil dot or moa dot. They are very precise, easy to understand and always hold the same value. Another option would be a lighted reticle, but some people have reported having trouble with this one messing with their vision and making it hard to take a clear shot. Magnification power is something else you want to keep in mind. Not only will this affect the price of your scope, but also the weight. You really don’t need to overdo it. Most large game hunting would be fine for a scope that is 3×9 or 4×12. This will show what’s in your field of view as three times the size up to nine times the size, or 4 times the size up to twelve. You only really need to go bigger than this with long-range targets or a longer range small target, such as varmint hunting. Most large game hunting occurs between 200-400 yards, but if you’re needing something more in the 800-yard range, then you should consider going with the higher magnification numbers. The Leupold VX-2 3-9x40mm is a compact, waterproof and fog proof rifle scope. This scope seems to have it all. It is overall very compact and lightweight, but also incredibly rugged with both the waterproof and fog proofing features. It tends to be a very modestly priced scope, and it comes with Leupold’s famous full lifetime guarantee. Many customers of this scope praise the lighter weight at only 11.2 oz, the clarity, and the large 4” eye relief. Some of the negative reports from customers claim focal problems at 9x for targets less than 50 yards away. Designed for use with Nikon's Spot On Ballistic Match Technology. The Nikon M-308 4-16x42mm riflescope with BDC (bullet drop compensator) 800 reticle. This scope boasts a large magnification range, a quick focus eyepiece, large objective lens, and is also waterproof, fog proof and shockproof. This is a very attractive looking long range scope with rugged hand adjust turrets. Per customer reviews, it also is backed by a lifetime guarantee by Nikon and comes with built on lens covers. Most customers are very happy with the Nikon M-308 and compare its quality to that of Vortex optics scopes. They are reporting over and over good performance, great optics and a slim profile. Some complaints customers are having are that after x8 magnification the eye relief is useless. Also, many are reporting that even when advertised, this scope does not come with the mount. 4-14X MAGNIFICATION: Features the patented ACSS HUD/DMR reticle that stays true through the scope's entire magnification range of 4x through 14x. ACSS HUD DMR RETICLE: Features quick ranging, wind holds and leads using .308 chambered rifles. ILLUMINATION: Features 6 brightness settings with an "off" notch between each setting. RUGGED AND DURABLE: Constructed of high quality aluminum with an anodized matte black finish, this scope is waterproof, shockproof, and nitrogen purged. 3-YEAR WARRANTY: If a defect due to materials, workmanship, or normal wear and tear has caused your product to malfunction, Primary Arms will either repair or replace. Other great features embodied in the Primary Arms 4-14×44 FFP include rugged waterproof, shockproof, fog resistant design, large objective lens, an illuminated red dot center reticle with 6 brightness settings to help with night vision, and a 3-year warranty. Customer reviews for this scope are very good, with people loving the illuminated reticle, the accuracy at 600-800 yd ranges, and great price comparisons given the feature combinations. However, some people have reported not really caring for the turrets, wishing they were a little more tactical. Fourth on our list is the TRACT RESPONSE 4-16x42mm riflescope w/ BDC 308/7.62 Reticle. This scope is my personal favorite! It is a long-range tactical, specifically built for the AR platform. Glass etched BDC reticle, multi-coated 42mm objective lens and those great tactical hand adjust turrets are all inclusive in this package. Plus, it is argon gas purged, making it completely waterproof and fog proof. This scope truly has it all. Customer opinions of this scope are great across the board without any real issues. Most seem to have purchased this scope multiple times for multiple arms, they like them so much. 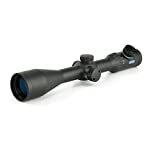 Last but not least on our list is the Hawke Sport Optics HK6426 Endurance 30 Side Focus 4-16 223/308 IR Scope. This scope is a favorite of many. With a simple but reliable glass etched red dot illuminated reticle and a side focus parallax control that adjusts from 10 yards to infinity, you certainly will not be disappointed with its performance. This optic does require a lithium metal battery for the reticle function but comes supplied with one, as well as a sunshade and lens covers. The turrets are not nearly as fancy as some other models, but very easy to adjust with a beautiful low profile. What’s not to love about the Hawke? Obviously, other customers are feeling the same way, reporting that they don’t just like or recommend this scope; they LOVE this scope! Praising super clear optics, near infinite eye relief, and easy, smooth and quick adjustments, we couldn’t really find one single complaint about it. One very happy customer stated, “Unless you’re into buying $1,000+ Vortex optics scopes, you won’t be able to beat this one.” I think that about says it all. What is a reticle on a rifle scope? – The reticle is the cross-hair or aiming point that you focus your field of view on through your optics. You must focus it for your eye first by looking through the optic at a blank wall and focusing at the highest magnification. What is the difference between first and second focal plane? – The first focal plane will be more accurate a shot, with the reticle pattern actually increasing or decreasing in size with the magnification. The second focal plane will always leave you with the same size reticle regardless of magnification. What is eye relief on a rifle scope? – Eye relief is the distance that your eye must be from the rear lens in order to view the whole image or field of view. Generally speaking, the eye relief is shorter the more magnification your scope provides. What about Vortex optics as a brand? – Vortex optics make some excellent scopes and they do have great options for the 308 bolt action rifle. They just didn’t make it into this particular review because we felt the five scopes above were better fits. Without question, there are an immense number of great scopes out there packed with awesome features. Hopefully, this helped you to narrow down the best scope for a 308 bolt action rifle. Ultimately it comes down to your personal preferences and what would be most useful for what you need. Whether it’s ruggedness, fine optics, specialize reticles, variance in magnification, or a good mix of these, I’m sure you now have a good idea of the performance you would like to see out of your firearm. If you liked this article you may like reading about scopes for muzzleloader rifles.